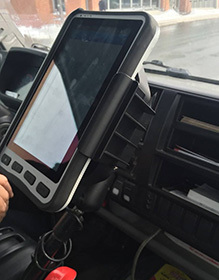 To operate efficiently and effectively in the transportation services industry, businesses require real-time communication, route optimization, asset tracking, and data transfer between drivers and dispatchers. The right technology not only maximizes operational efficiencies, safety, and customer service, but also saves time and reduces costs. 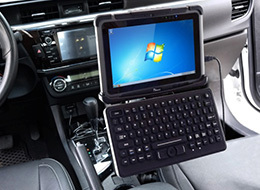 Winmate's rugged mobile tablets, handhelds, fixed-mount computers, and ultra-rugged tablets, were specifically designed to meet the demands of this fast paced industry - increasing efficiency and withstanding rigorous use. 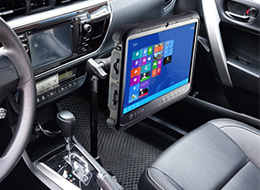 All Winmate mobile tablets are equipped with vehicle docking for easy mounting to a variety of standard VESA mounts or universal AMPS hole patterns, such as those available from RAM Mounts. These may be securely mounted inside a truck and other vehicles and quickly dismounted from the docking to assist in field operation. Why did the customer choose M700DM4? 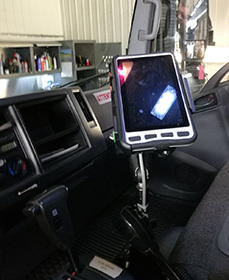 When the customer was considering whether to purchase a consumer tablet or rugged tablet for this project, Winmate asked the customer to consider these risks and rewards. 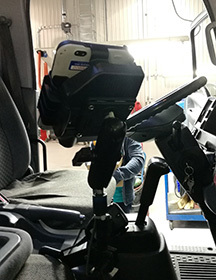 The sticker price of a consumer tablet may seem lower than the price of a rugged tablet at first glance, but when a tablet is not built for industrial environments, the risk for damage also increases. Saving a few dollars on the initial investment will ultimately cost more money and headaches when the unit requires frequent repairs or has to be prematurely replaced because of physical damage, compromised functionality, and productivity loss. The M700DM4’s processing power comes from a Quad-Core ARM Cortex-AT processor resulting in ultra high performance with low power consumption. The Android 4.2 tablet features a brilliant 7-inch, sunlight-readable projective capacitive touch screen. 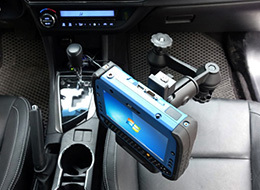 It also enables connectivity and reliable wireless communication with 4G/LTE, 802.11 a/b/g/n WiFi, Bluetooth 2.1, and options for highly accurate U-blox GPS. The device is ready to operate on any mobile carrier.